For centuries, salt has been regarded as essential to human health. Recently there has been an intense discussion on the benefits and potential harm of reducing salt (sodium chloride) intake in the general population. A long-term advocate of salt reduction is Dr. Graham MacGregor from Queen Mary University of London, UK. In the opposite side there is a growing number of Doctors who disagree about a generalized sodium restriction. One of these is Dr. Michael Alderman from the Albert Einstein College of Medicine, New York, USA, that says the available data provides no support for any universal recommendation of a particular level of dietary sodium (1, 2). Anyway, it is important to emphasize that a general reduction in dietary salt intake can only be achieved by reducing the sodium chloride content of processed foods, as these account for 75% to 80% of the sodium chloride consumed daily (3). Even the existent table salt is industrially processed with the essential and trace minerals removed almost completely. Recently an European study questioned the need to reduce the salt intake in the general population and refuted the computer-generated estimates of the lives and healthcare costs that would be saved by lowering sodium consumption. The authors have stressed that previous studies on which recommendations to lower sodium intake are based are all short term, controlled intervention trials, in which there are reductions in blood pressure in hypertensive patients and a small decrease in blood pressure in normotensive volunteers with sodium reduction, and these studies have been extrapolated to the population as a whole. The authors also note that the assumption that lower salt intake would in the long run lower blood pressure, has not confirmed in longitudinal population-based studies. The most controversial finding from this prospective population study involving 3681 participants, without cardiovascular disease, was that the lower sodium intake - as measured by 24-hour sodium excretion - was associated with higher cardiovascular mortality. In their study the authors say that the underlying mechanisms explaining the inverse association between cardiovascular mortality and 24-hour urinary sodium excretion might be that a salt intake low enough to decrease blood pressure also increases sympathetic nerve activity, decreases insulin sensitivity, activates the renin-angiotensin system and stimulates aldosterone secretion (4). This European study is not the first to find that a low-sodium diet is detrimental for health. The NHANES study published in 2006, constituting a sample with 7154 participants, found that the low sodium diet was associated with the stimulation of the sympathetic nervous system, with an increase in mortality outcomes in cardiovascular disease and by all causes (5). In other short term trials was also observed activation of the renin-angiotensin-aldosterone system and in the sympathetic nervous system, a decrease in insulin sensitivity and increases in LDL cholesterol concentrations, triglycerides and uric acid (6). Graham MacGregor, invited for commenting the study by Heartwire (7) have demonstrated irritation regarding the remarks on the possible underlying mechanisms cited in the European study (4), saying “We have shown in our meta-analysis that reducing salt by the amounts we are recommending does not increase sympathetic tone, there is a trivial increase in renin, and no evidence of any adverse effects, no physiologic meaning whatsoever” Dr. MacGregor also have reacted in 2003 (8), in a correspondence to Circulation on the findings by Grassi and colleagues that found effects of modest salt reduction on sympathetic activity (9). On the other side, because plasma norepinephrine levels during high salt intake remain unaltered in salt-sensitive hypertensive patients but are reduced in normal subjects and non-salt-sensitive hypertensive patients, abnormal relationships between salt intake and sympathetic activity have been suggested (10). It is interesting to note about the discovery that a high sodium diet may depress arterial baroreceptor reflex in normotensive people, with sympathetic activation (11). A recent review article by researchers at Boston University School of Medicine (BUSM) debunks the widely-believed concept that hypertension, or high blood pressure, is the result of excess salt causing an increased blood volume, exerting extra pressure on the arteries. Published online in the Journal of Hypertension (13), the study demonstrates that excess salt stimulates the sympathetic nervous system to produce adrenalin, causing artery constriction and hypertension. This study cites that several investigators throughout the 1960s and 1970s had reported elevated plasma catecholamine levels in up to 40% of patients with essential hypertension (14-17), as well as an association of increase in catecholamines with high sodium intake in experimental animals and humans (18-21). Taking in view that both restriction and high intake of dietary sodium may be deleterious to human health, I do not share the opinion that indiscriminate restriction in dietary sodium intake at population level and as a universal recommendation is the a good solution to help in the prevention of cardiovascular disease. In my idea salt balance should be thought according individual requirements. 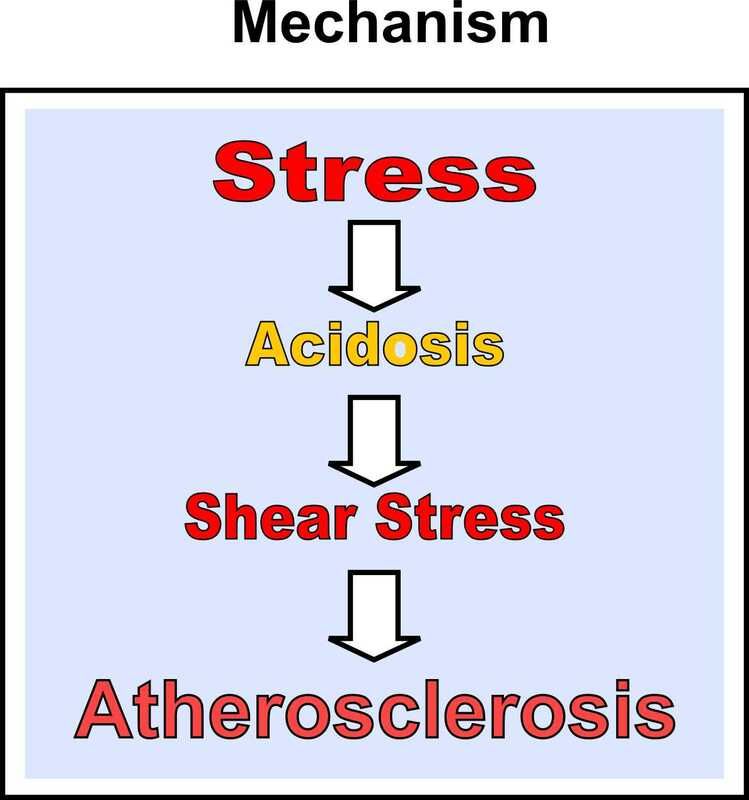 Moreover because we believe that sympathetic predominance is the primary factor in the cascade of events leading to cardiovascular disease, according our acidity theory of atherosclerosis (12). A new study (22) has shown that people consuming too much salt and too little potassium in their diet have had a significantly raised risk of death from cardiovascular disease compared with those who had the lowest ratio of sodium to potassium. The study, with an average of 14.8 years of follow-up, collecting data on 12,267 people, isn't the first study to find an association between high blood pressure and high levels of salt consumption and low levels of potassium intake. However, Dr. Elena Kuklina, co-author of this study, told to Heartwire (23) that this was the first large, nationwide study looking at sodium and potassium at the same time. She also told that "The major implications of their findings are that a diet balance in both nutrients is important. People should try to reduce sodium in particular by consuming less processed food, but also they should increase potassium intake". Dr. Kublina have also stressed join Heartwire that people must understand the massive impact that processing has on foods. She cites, for example, that 100 g of unprocessed pork contains 61 of sodium and 340 mg of potassium, but turning this into ham alters that ratio significantly, to yield a whopping 921 mg of sodium and, to boot, reduces the potassium content to 240 mg.
Talking about the results of this study, Dr. David Brownstein, a colleague from THINCs, has made an interesting observation inside of our internal forum, on the high intake of salt depending of his kind if refined or unrefined salt. Dr. David told that "Refined salt lacks potassium. Refined salt use leads to sodium/potassium imbalances. This can be rectified by using unrefined salt which contains both sodium (lower amounts as compared to refined salt) and potassium. This article should have been titled "The problems with Refined Salt: Potassium Deficiency." I agree with Dr. David Brownstein, on his opinion. Mainly taking the importance of alterations in sodium/potassium activity expressed in the acidity theory of atherosclerosis paper (12). 5. Cohen HW, et al. Sodium Intake and Mortality in the NHANES II Follow-up Study. The American Journal of Medicine (2006) 119, 275.e7-275.e149. 14. de Champlain J, Farley L, Cousineau D, van Ameringen MR. Circulating catecholamine levels in human and experimental hypertension. CircRes 1976; 38:109–114. 15. Louis WJ, Doyle AE, Anavekar S. Plasma norepinephrine levels in essential hypertension. N Engl J Med 1973; 288:599–601. 16. Sever PS, Osikowska B, Birch M, Tunbridge RD. Plasma noradrenaline in essential hypertension. Lancet 1977; 1:1078–1081. 17. Lake CR, Kopin IJ, Ziegler MG, Coleman MD. Plasma catecholaminesand neurogenic hypertension. N Engl J Med 1977; 297:53–54. 18. de Champlain J, Krakoff L, Axelrod J. Interrelationships of sodium intake, hypertension, and norepinephrine storage in the rat. Circ Res 1969; 24 (Suppl):75–92. 19. Reid JL, Zivin JA, Kopin IJ. Central and peripheral adrenergic mechanisms in the development of deoxycorticosterone-saline hypertension in rats. Circ Res 1975; 37:569–579. 20. Murray RH, Luft FC, Bloch R, Weyman AE. Blood pressure responses to extremes of sodium intake in normal man. Proc Soc Exp Biol Med 1978; 159:432–436. 21. Nicholls MG, Kiowski W, Zweifler AJ, Julius s, Schork MA, Greenhouse J. Plasma norepinephrine variations with dietary sodium intake. Hypertension 1980; 2:29–32.